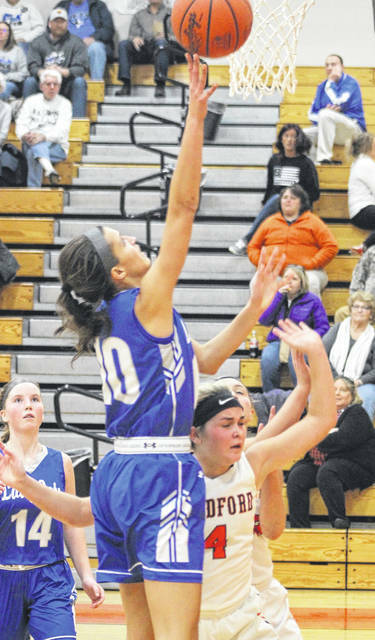 Corina Conley goes in for a score against Bradford on Thursday night. Conley led Franklin-Monroe with a career-high 27 points in beating the Railroaders 60-26. Bradford’s Austy Miller drives around the Franklin-Monroe defense in a Cross County Conference battle on Thursday night. Miller had 17 points in a 60-26 loss for the Railroaders. Franklin-Monroe’s Belle Cable goes in for a score against Bradford on Thursday night. The Jets defeated the Railroaders 60-26. Bradford’s Bianca Keener throws a pass from the top of the key during a game against Franklin-Monroe on Thursday night. The Jets beat the Railroaders 60-26. Franklin-Monroe’s Chloe McGlinch works her way around Bradford’s Rylee Canan during a Cross County Conference game on Thursday night. The Jets won the game, 60-26. Franklin-Monroe’s Chloe Peters drives through Bradford’s Cassi Mead (33) and Bianca Keener (40) during a Cross County Conference game on Thursday night. The Jets won the game, 60-26. Franklin-Monroe’s Chloe Peters goes in for the easy layup during a Cross County Conference game at Bradford on Thursday night. The Jets won the game, 60-26. Franklin-Monroe’s Corina Conley fights for a rebound with Bradford’s Cassie Mead during a Cross County Conference game on Thursday night. The Jets won the game, 60-26. Bradford’s Emma Canan tries to get away from Franklin-Monroe’s Belle Cable during a Cross County Conference game on Thursday night. The Jets won the game, 60-26. 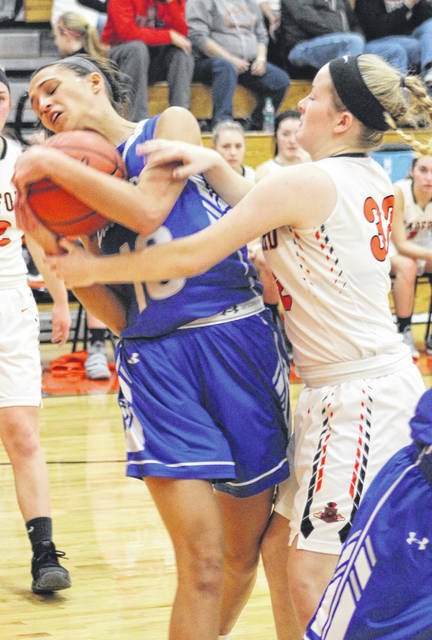 Bradford freshman Austy Miller battles for a rebound with Franklin-Monroe’s Chloe Peters during a Cross County Conference game on Thursday night. The Jets won the game, 60-26. 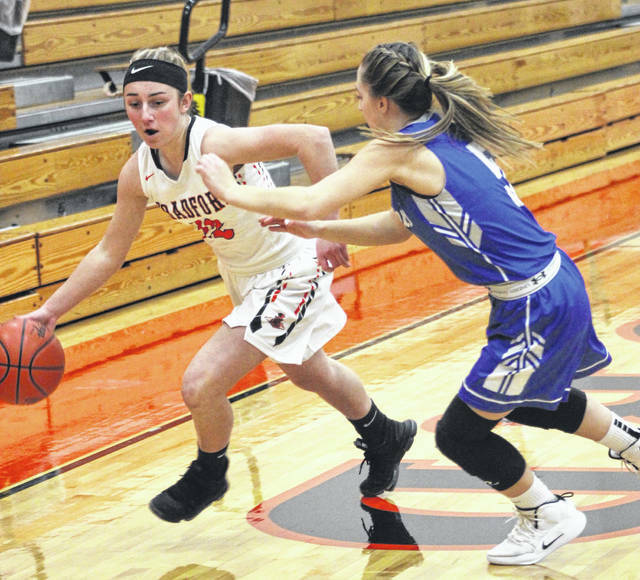 Bradford’s Rylee Canan drives around Franklin-Monroe’s Stella Shellabarger during a Cross County Conference game on Thursday night. The Jets won the game, 60-26. Franklin-Monroe’s Kennedy Morris plays some stiff defense on Bradford’s Austy Miller during a Cross County Conference game on Thursday night. The Jets won the game, 60-26. 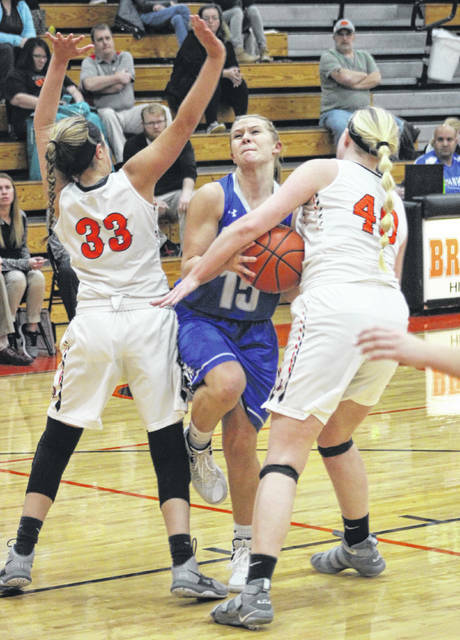 BRADFORD – The Franklin-Monroe girls basketball team has been a tear of late. Beginning with a Dec. 22 victory over Houston, the Lady Jets have won 8 of their last 9 games to get to 13 wins for the season. Win No. 13 came on Thursday night against an up-and-coming young Bradford squad that has lost two of its best players to injury. Franklin-Monroe came out aggressive to start the game with eight consecutive points on two 3s for junior Corina Conley and a bucket by sophomore Stella Shellabarger as the Jets closed out the opening frame with a 13-5 lead. 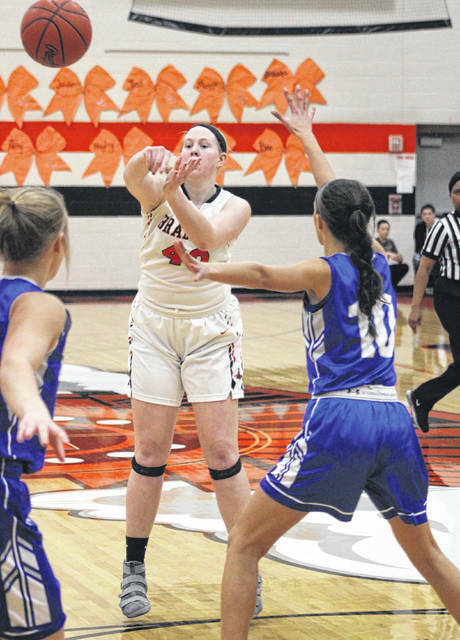 The other three quarters were much the same as the Lady Jets rolled to a 60-26 road win. It was more of the same in the second quarter for the Jets as Conley scored 13 of her career-high 27 points. It was the second time this season the junior has scored 27 in a game. She connected on four straight free throws to begin the quarter, first at the 7:23 mark and then again at the 6:40 mark. At 6:02 she stretched the Jets lead to 19-7 on a bucket and then made it 23-9 at the 3:09 mark on a half-court pass from Kennedy Morris for the layup. With 2:03 left before the break, Conley helped herself by stepping in front of a pass for a steal and taking it all the way to the hole herself for a 27-9 lead. Conley ended her second quarter onslaught with an old-fashioned 3-point play by sinking the bucket and the added free throw with 58 seconds left before halftime. “Corina worked really hard in the offseason on her outside shot and that has added a whole new dimension to her game,” Moore said of Conley, who drained four triples in the contest. “She was able to knock them down tonight and it was a great addition to our offense as she tied her career high of 27 points from earlier this season. When she comes out and plays aggressive it just sets the tone for our team. 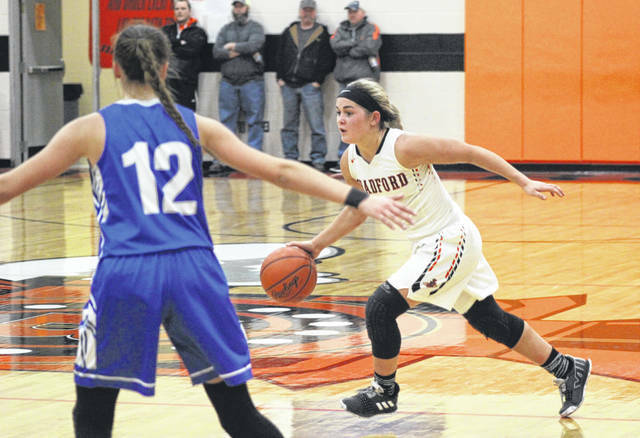 Bradford has hung its hat on strong defensive performances most of this season, but the Railroaders just couldn’t corral Franklin-Monroe this time. Freshman Austy Miller led the Railroaders with 17 points. 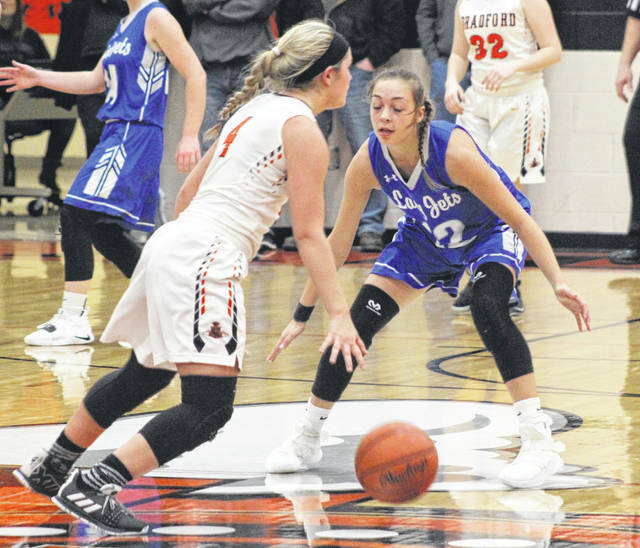 She was the only Bradford player to reach double digits and the only one with more than 4 points. “When Austy (Miller) has to shoulder the offense like that for us it just wears her out,” Besecker said. “We lost our top scorer and rebounder (sophomore Skipp Miller) obviously and now Lex (Alexis Barhorst) is out too. She was our best perimeter shooter along with Austy and was just starting to get going when she went down. That is a little frustrating, but we have to remember we are putting almost all freshmen and sophomores on the floor so we have to be patient. Franklin-Monroe (13-4, 8-2 CCC) had seven players reach the scoring column. Besides Conley’s 27 points, Chloe Peters also scored in double figures with 10. Shellabarger had 7 and Morris and Chloe McGlinch contributed 6 points apiece. 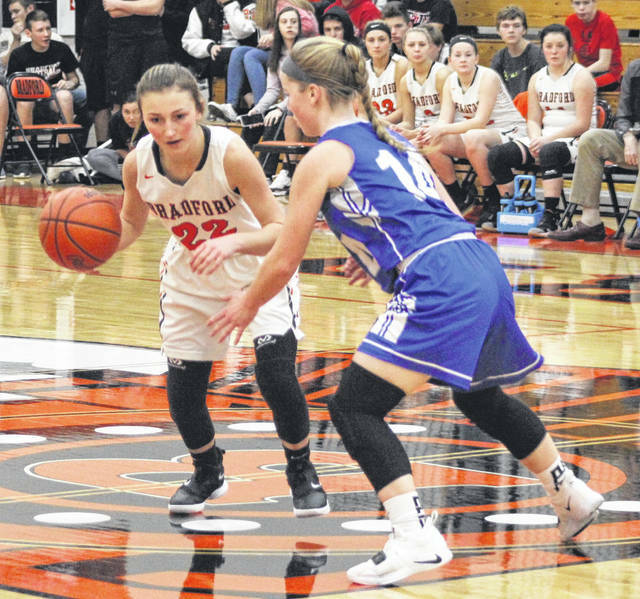 FM returns to action on Saturday with a 12:30 p.m. start at troy Christian, while Bradford gets back at it on Tuesday with a 6 p.m. game at Arcanum in a makeup contest from earlier this season. 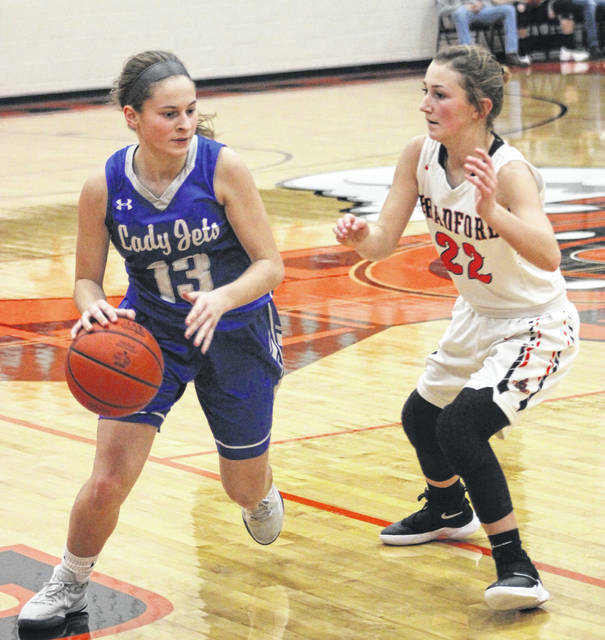 Franklin-Monroe – Skylar Bauman 1 0 2, Belle Cable 1 0 2, Corina Conley 9 5 27, Kennedy Morris 3 0 6, Chloe McGlinch 3 0 6, Stella Shellabarger 3 0 7, Chloe Peters 4 2 10. Totals: 24 7 60. Bradford – Austy Miller 7 1 17, Emma Canan 0 1 1, Abby Fike 1 0 2, Rylee Canan 1 0 2, Bianca Keener 2 0 4. Totals: 11 2 26. 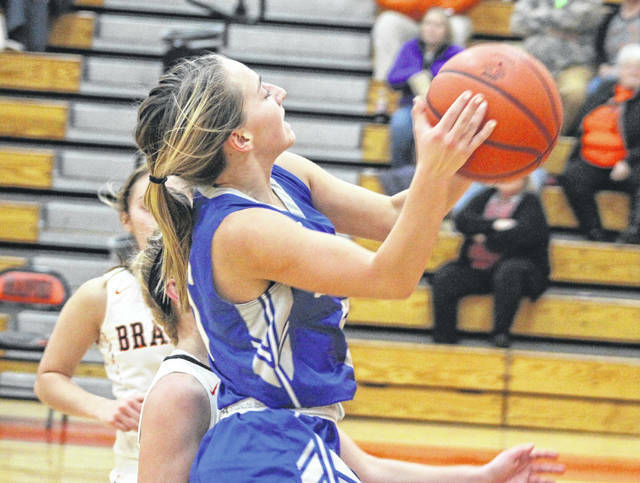 3-pointers – Franklin-Monroe 5 (Conley 4, Shellabarger 1), Bradford 2 (A. Miller 2). Records: Franklin-Monroe (13-4, 8-2 CCC), Bradford (12-5, 6-4 CCC).